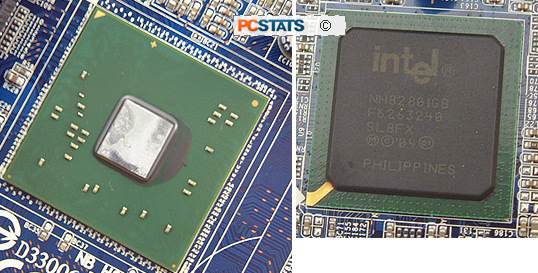 The Intel 945G Express is Intel's latest mainstream performance chipset and it supports every socket 775 processor on the market from the Intel Pentium 4/D/XE, Celeron D right on through to the Intel Core 2 Duo. In this instance the 945G Express is paired with the venerable Intel ICH7 Southbridge, rather than the updated ICH8 core logic. The ICH7R brings RAID 0,1,5,10 into the fold, but the Gigabyte GA-945GM-S2 motherboard does not use this southbridge. Given the intended markets this board is suited towards, RAID 1 would have been a really nice feature to put into operation. The extra measure of data redundancy a RAID 1 array brings to the table is hard to ignore, especially considering how affordable a pair of 250GB SATA hard drives has become. Intel kept DDR2 memory support steady at 667MHz with the 945G Express chipset, putting it at a slight disadvantage to AMD's Socket AM2 Athlon64 processors. Intel calls the new memory controller FMA or 'Fast Memory Access' and it gives the system a maximum theoretical bandwidth of 10.6GB/s with DDR2-667 memory. Like many of Intel's mainstream chipsets before it, the 945G Express incorporates integrated graphics - this time it Intel's Graphics Media Accelerator 950. The Intel GMA950 is compatible with both Microsoft WindowsXP and Windows Vista operating systems, and is based on a 400MHz 256-bit graphics core which has up to 10.6GB/s bandwidth. The GMA950 can process 1.6GPixels/s and 1.6GTexels/s while supporting resolutions as high as 2048x1536 at 75Hz. Gaming and 3D performance is lackluster at best, and not even remotely comparable to what you would see from a full fledged PCI Express x16 graphics card, but at least the GMA950 is DirectX9 / OpenGL1.4 compatible. It's Dynamic Video Memory Technology 3.0 (DVMT) steals 224MB of system memory for the GMA950's use. More importantly, Intel has built in high definition content support up through to 1080i/p resolutions, and native 16:9 aspect ratio. HDTV playback is supported via a HD content decoder, 5x3 overlay, and hi-bitrate MPEG2 among other points. In other words, this integrated videocard is built to play high definition content without any fuss over your computers' analog or digital monitor. The Intel 945G Express is a mainstream chipset, and thus only supports a single PCI Express x16 graphics card, with no possibility of SLI or Crossfire. The ICH7 southbridge includes an additional four PCI Express lanes which are typically divvied up between PCI Express x1 slots and Gigabit network adaptors. The ICH7R southbridge can add an additional two PCI Express x1 devices, for a total of six, when it is used. A dedicated I/O bus connects the Intel 945G Express Northbridge and ICH7 Southbridge together, which might be a little tight if you have many high bandwidth devices installed but should be just fine for the average user. The Gigabyte GA-945GM-S2 motherboard comes installed with the ICH7 Southbridge which includes all the necessary goodies, though in slightly smaller quantities than the ICH8 supports. There are four 3GB/s Serial ATA II channels as well a 7.1-channel Intel Azalia High Definition audio codec, eight USB 2.0 ports (split between the rear I/O and headers), 4 PCI Express x1 lanes and six PCI bus masters. Noticeably lacking from the Intel 945G Express and ICH7 chipsets are the standard allotment of two parallel IDE channels. The ICH7 support one alone, regrettably. Gone are the days of two UDMA ATA100 IDE connectors per motherboard as a stock option, instead Intel has curtailed support to a single IDE channel (supporting two IDE devices) which is really only good for optical drives. In response to this standalone IDE controllers have made it onto some motherboards, though generally only the enthusiast oriented ones. Like you, we're still not ready to give up on our collection of IDE hard drives just yet, but we aren't buying any new ones either.